A family of nine has been killed in an airstrike on a Yemeni village near Sanaa, residents report. 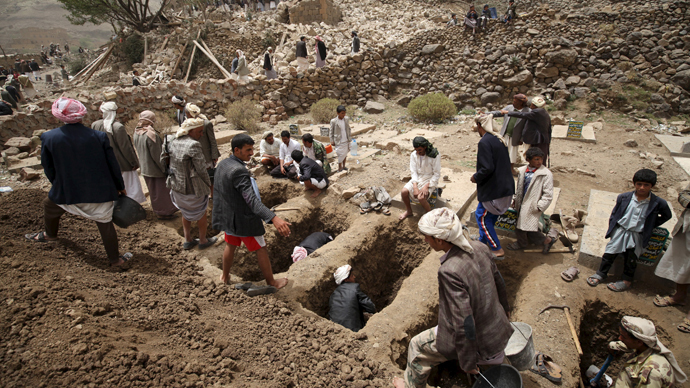 Five others have been wounded, while several others remained trapped under rubble, according to Yemeni media. The strike, which on Friday evening hit the Okash village – just a few miles away from a military base outside the capital – killed two men, a woman, and six children, Reuters reported, citing residents. The state news agency Saba posted a picture on its website showing three children lying next to each other with pieces of paper with the date April 3, 2015 written on them. However, the authenticity of photo has not yet been verified. A Saudi-led military coalition began launching airstrikes against Yemen’s Houthi rebels last week. The operation intends to bring ousted President Abd Rabbuh Mansur Hadi back into power and prevent the Houthi militants and backers of Hadi’s predecessor Ali Abdullah Saleh from gaining full control of the country. In Aden, a southern port city which has seen the fiercest clashes in the country, medics say that fighting has left at least 185 people dead and more than 1200 wounded since the violence sharply escalated last week. Aden had been one of the loyalists’ few remaining footholds in the country, where Hadi had been holing up after being forced out of the capital by the Houthis in February. Hadi fled the country for Riyadh last week. The head of Aden’s health department Al-Khader Lassouar told AFP that three-quarters of the casualties were civilians, adding that the actual death toll is likely much higher as the Houthis and their allies do not take their causalities to public hospitals. Lassouar also called for international aid organizations and Arab States to provide emergency medical supplies to Aden’s hospitals. “Medicine stocks are exhausted and hospitals can no longer cope with the increasing number of victims,” he said. International Committee of the Red Cross (ICRC) representative Sitara Jabeen told RT that the organization is making breakthroughs in negotiations for a 24 hour in order to get aid into the country. “We are now waiting for a formal greenlights. We hope that by tomorrow we will be able to send our supplies and our personnel to Yemen,” she said Saturday. She emphasized that the organization was talking to all parties in the conflict. Earlier, the ICRC released a statement calling for an immediate 24-hour humanitarian pause in hostilities. “All air, land and sea routes must be opened without delay for at least 24 hours to enable help to reach people cut off after more than a week of intense air strikes and fierce ground fighting nationwide,” the ICRC said in a statement on Saturday. Three shipments of aid and medical staff from the ICRC had been blocked for several days because of both the Saudi-led aerial bombardment as well as intense clashes on the ground between Yemen’s rivaling factions. Several boats and planes containing over 48 tons of medical supplies are awaiting security clearance to leave for Yemen. A four-person surgical team is also on stand-by in Djibouti waiting to be dispatched to Aden by boat.